I am hoping this is the most appropriate location for this question. It has to do with the undercarriage of the vehicle. I have a 2012 Honda Civic Hybrid that my wife thought was fine to drive over a rather large rock in the middle of the highway. Long story short, a piece underneath is damaged that I am looking to replace. Currently I can't get a definitive part number because we have some unusually cold temperatures and heavy rain right now so I can't get under there to take the piece off entirely, however I have some photographs and can describe what it is. 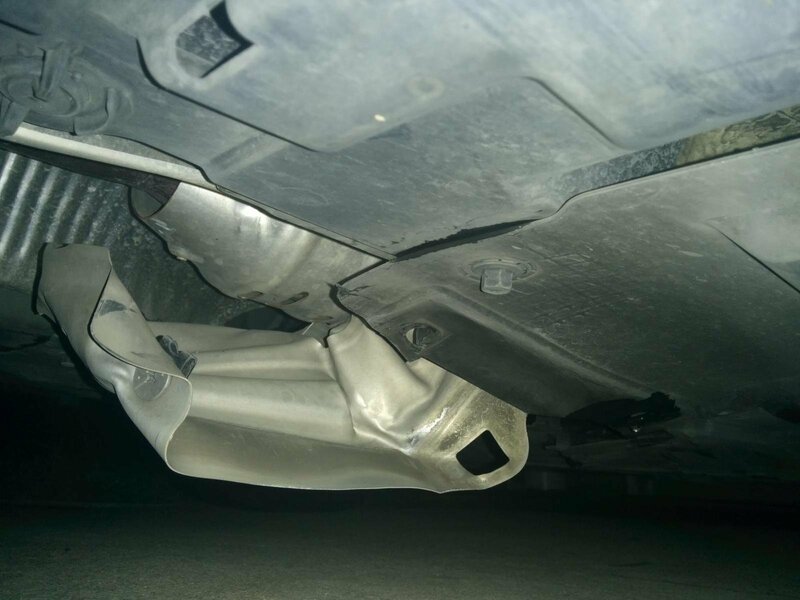 Basially, it's a metal plating (appears to be aluminum--very pliable) that is connected to the plastic undercarriage pieces near the front directly in the middle (it's slightly to behind the front axles). Right now it is being held on by one screw. I was thinking the part was 74621-SNC-A00, but it doesn't seem quite right. It's pretty mangled right now so I am most likely just going to have to purchase a replacement (it also tore through the connective hole in the plastic undercarriage on one side so I will probably have to get that part replaced as well). My main question is how safe is it to temporarily drive without this piece attached? Secondly, does anyone know what that part actually is? I have attached a couple photographs below (apologize for quality as I had to snap them after the sun went down since the rain settled for a bit). Thanks for the help. 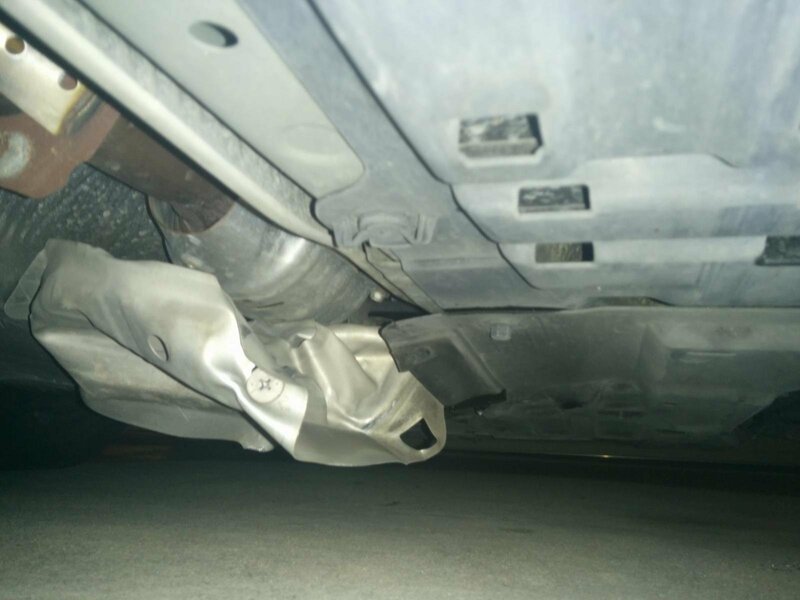 Looks like the heat shield for your catalytic converter. Should be fine to remove and drive without as long as no plastic is in contact with the cat itself due to damage. took mine off because it was all beat up and over time it will sag/drag on the floor. Last edited by immajackuup; 11-24-2013 at 10:52 PM. Ok, will look into that and see if I can find the part. The plastic is still fine from what I can tell (other than one of the mounting holes being torn as can be seen in one of the photographs). Thanks for the help again. yep these cars are very low and you cannot run over a dead squirrel in the road without tearing the underside and making it drag. basically, you can A: run off the highway and hit other debris if you see slight debris. B. Run into oncoming traffic trying to avoid the slight debris. or C: run the debris over and kill the underside of your car. I would definitely recommend this car if your only goal is to get good gas mileage. and then you need 0 deductible and unlimited rental car if you still want the Honda civic hybrid.